""Distance Over Time" returns to an assumed balance between dexterity and emotion. The Americans are back with their best album since Mike Portnoy's departure." 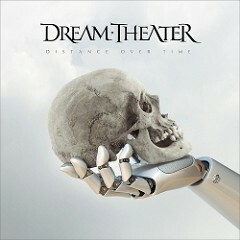 The cover of Dream Theater's 14th album is highly symbolic and leaves a lot of room for interpretation and questioning. The context of the release of this "Distance Over Time" is the same for almost 16 years and all the releases that followed "Six Degrees Of Inner Turbulence". "Train Of Throught" marked a relative break between the band and some nostalgic fans or reviewers who miss the "old" Dream Theater. Many criticize the Americans for having given in to modern metal tendencies against nature, to an excessively marked inspiration (Muse, Metallica, Tool) and for having released bloated albums of sterile lengths privileging individualities to the detriment of a real group work. Aware of these criticisms, justified or not, the band draws inspiration from Shakespeare, particularly Hamlet and his famous existential question, to illustrate his new album. To be or not to be the band before, that's the question? Returning to fundamentals or continuing the evolution begun in the mid-2000s? Pushing this preliminary reflection further, the hand holding the skull is that of an android (a reminder of the dystopia of "The Astonishing") and further marks this opposition between the human being who is no longer and the coldness of the technique that has taken over. And what if the answer to the question lies in between? The duration of the disc and each track gives an immediate indication. If "The Astonishing" took the form of a double album, long and composed of about thirty tracks, "Distance Over Time" is its conceptual opposite: nine tracks (excluding bonuses) none of which exceed ten minutes for less than one hour of music! If formally it differs from it, the same applies to the substance. Dream Theater returns to a heavy and powerful sound that puts riffs and rhythm to the fore. The introductory "Unterthered Angel" sets the stage for what the album is all about. In the first few seconds, the sound wall comes with the alloy of drums, bass and guitar all sails out. Despite a production still too compressed, the sound seems to have undergone some improvements, especially concerning Mangini, which benefits from a better spectrum, even if it is not yet perfect, especially for cymbals that are still far too muffled. Power is therefore required in the aggressive verses balanced by a short and bright chorus but in which the effects on James Labrie's voice seem far too loud. 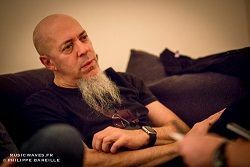 The instrumental bridge gives way to the traditional instrumental jousts between Petrucci and Rudess, whose work is remarkable for its sobriety. The release contains four four-minute pieces that allow you to take a few breaths. We didn't dare to hope for it any more, but Dream Theater still knows how to compose short and devilishly effective tracks like the ballad "Out Of Reach" which will undoubtedly be among the most beautiful written by the group. "Paralysis", falsely mid tempo, alternates between the heavy and soaring atmospheres in which John Petrucci lets his guitar wander in expressive solos. It must be said that in this new album, he illuminates with his class all the tracks that contain less shred, more sensitivity, more variations, relief and progressiveness. How can we not fall under the charm of the very beautiful instrumental movement of 'Fall Into The Light' and its exchanges between Jordan Rudess' piano and an enchanting solo? Dream Theater also demonstrates with 'Barstool Warrior' that he is still able to compose beautiful progressive, epic and above all concise and balanced tracks. This track is a fluidity that we no longer thought we could hear in the United States and is an emotional roller coaster that reminds us of the great hours of "Six Degrees Of Inner Turbulence" (second CD), minus the pompous side. S2N' (or Signal To Noise) also evokes this turbulent atmosphere in its chorus ('War Inside My Head') and proves the band's admiration for Rush with a flashy and roaring bass finally put forward in the mix ('Room 137' also) and breaks that the Canadian trio would not have denied. Despite everything, Dream Theater falls back into certain misconceptions that somewhat temper the general good impression, notably with this incomprehensible fade out in 'At Wit's End' which suddenly interrupts a very beautiful passage by Petrucci or the few abrupt sequences of 'Pale Blue Dot' which still give the impression that the combo cannot sufficiently channel its ideas. However, the album ends with a nice Whitesnake-like rock surprise with 'Viper King' particularly enjoyable and unusual for the group. In the end, it's been a long time since Dream Theater had accustomed us to so much density in its latest productions. "Distance Over Time", without constituting a total return to the roots comes back to a more assumed balance between dexterity and emotion, the former being at the service of the latter. The Americans are back in boss mode and offer their best album since Mike Portnoy left the band. Il n'y a plus qu'à attendre impatiemment le 22 février pour pouvoir en juger ! Il y a bien longtemps que Dream Theater ne me faisait plus sourciller : comme le souligne à juste titre Calgepo, je fais partie des "Francis Cabrel" du prog metal. En revanche, il faut bien avouer que ce "Distance Over Time" est une vraie belle surprise d'un groupe dont je n'attendais plus rien ! Un album concis qui pioche dans les différentes époques du groupe pour un résultat très efficace comme chaque intro ultra-soignée et hyper addictive !